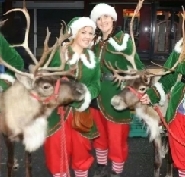 We hire reindeer throughout Manchester, Liverpool, Cheshire, Birmingham and surrounding areas with teams of 2,4,6,8 or more reindeer and fun and friendly elf handlers for Christmas events. Make your Christmas event a Magical and memorable one with a visit from real Reindeer! We enjoy spending lots of time with our reindeer all year round, with their stunning looks and adorable personalities they can quickly win the hearts of children and adults alike and bring a festive magical treat to any event. When out and about on reindeer hire visits our tame reindeer love to make lots of new friends, be hand fed their special treats and have their photo taken in their festive head collars and harnesses. Our reindeer display teams are available for reindeer hire for Opening Parades, Christmas Light switch-ons, Fairs, Sleigh rides, Grotto visits, shopping centres, school visits, weddings, private functions and many more events. 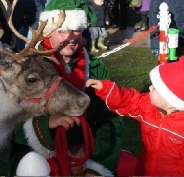 Reindeer hire displays are available with 2,4,6,8 or more reindeer, each with their own experienced fun and friendly elf characters or uniformed handlers to ensure your event is an exciting and successful one. Our Reindeer are available to rent for events throughout the North West, North Wales and the Midlands including Manchester, Liverpool, Lancashire, Cheshire, Flintshire, Shropshire, Staffordshire, Birmingham and further a field. 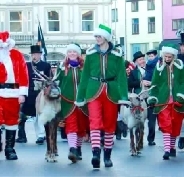 Experienced, professional and very entertaining Reindeer and Sleigh pull display teams available for amazing Light Switch on Parades, Santa's arrivals, Grotto launches and more. 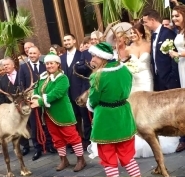 Turn your big day into an unforgetable and magical one with a visit from our gorgeous reindeer. Great pictures for you and your guests and Sleigh ride arrivals available. Reindeer display teams available to rent for fun and festive educational school visits or exciting end of term treats and Christmas Fairs.Special offer: weekdays from £495!